Our wall changing tables are childcare professionals, robust design and function facilities for public buildings : airports, stations, shopping centers , swimming pools , amusement parks , zoos , hospitals, service stations …. 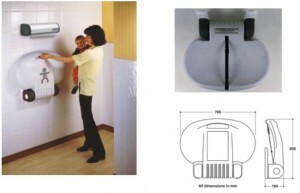 The horizontal ‘Compact’ baby changing table has been designed to address the dual problem of providing a safe, hygienic, ergonomically sound facility, whilst occupying the least wall space possible with the baby placed alongside, or parallel with the wall.• L’ouverture de la table à langer est contrôlée par les ressorts à torsion afin d’éviter une ouverture brutale. Large radil on all projecting surfaces to avoid the risk of bruising. Specially shaped table ends – allowing the limbs of larger babies to safely project beyond the table, free from dangerous protrusions. Totally enclosed hinge mechanism-end stops cannot form finger traps. Integral torsion springs ensure controlled lowering-table cannot accidentally drop and hit an adjacent child. Permanently fitted safety belt with a tamper proof snap fit closure to BS 6684 1989. Unique rotary urine seals completely protect the only external moving parts. 100% closed cell foam filled mouldings, avoiding bacteria voids. All mouldings are shaped to be easily cleaned, and are impervious to proprietary cleaners and sanitizers. Integral pressed steel chassis are embedded in both the table and hinge mouldings, which when bolted to the injection moulded wall plates achieve a weight loading in excess of 100kg. Supplied with all wall fixings for either conventional timber stud,or masonry walls. The table moulding is in a tough high-density Polypropylene, with integral foam core from fully polished tooling ensuring a smooth, easily cleaned, rigid structure. Hinge blocks in a soft finish Polyurethane, housing a pressed steel chassis for additional protection. 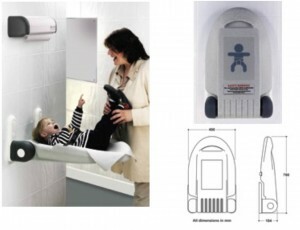 The vertical ‘Compact’ baby changing table has been designed to address the dual problem of providing a safe, hygienic, ergonomically sound facility, whilst occupying the least wall space possible by positioning the baby at right angles to the wall. This has resulted with the vertical table requiring only 490mm of wall space. 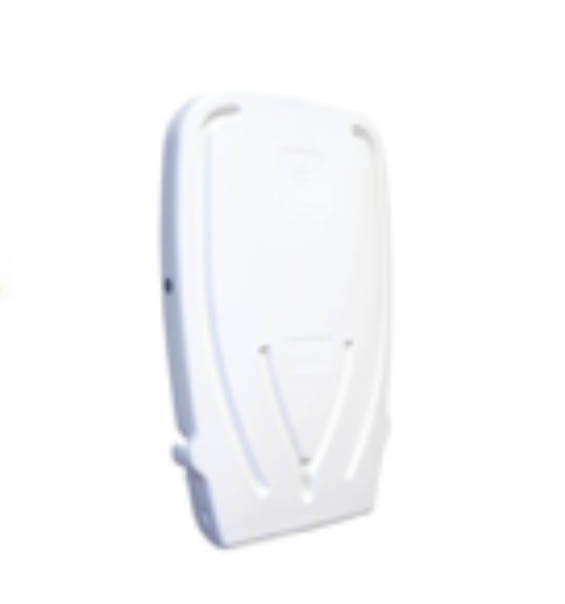 Heavy duty integral moulded hinges for strength and safety. Gas-strut dampened for controlled and safe opening/closing. Easy-load integral moulded dual liner dispensers, fully encapsulated for hygiene assurance. Twin integral moulded bay-hooks for convenience. Heavy-duty fixings for safety assurance. Large radius internal contours for comfort and safety. 2 years Warranty against defects in parts and workmanship. Construction : Microtextured, PEbd colour-fast L.D.P.E.. Opening angle ; opens to 87°(slightly tilting changing surface to wall). Retaining straps : Fully adjustable, colour co-ordinated heavy duty nylon. Installation kit : Dual purpose heavy-duty fixings suitable for fixing to timber studs and solid wall installations. 2 years Warranty against defects in parts and workmanship. Construction : Microtextured, PEbd colour-fast L.D.P.E..